Livestock managers seem to have an increasing awareness that poisonous plants can affect livestock. Part of this is due to the ever-increasing population of horse owners in Wisconsin and to the growth in management intensive grazing systems. Poisonous plant questions are also more frequent in dry years as droughts create situations in which animals often graze plants they would otherwise not eat and producers may harvest fields or plants that are not usually harvested to have adequate feed stock for the winter. Additionally, weeds not usually considered toxic might become poisonous under certain condition. For example, weeds may become more palatable to livestock following an herbicide application in a pasture or fencerow. This may result in animals eating plants they would normally avoid consuming. Weeds that are known nitrate accumulators (such as pigweeds and common lambsquarters) are particularly high in nitrate soon after a rain and grazing or feeding forage with these weeds under this condition could seriously affect animal health. Fortunately, we have relatively few cases of animal deaths due to consumption of poisonous plants. The magnitude of losses in milk and meat production and the cost of veterinary fees related to animals eating poisonous plants in Wisconsin are unknown but is undoubtedly significant. In 1988, losses exceeded $230,000,000 for 17 western states (Williams, 1994). Similar estimates for the north central region were not found. Prevention is always the best policy and the purpose of this paper is to point out some of the plants that are potentially harmful to livestock so that measures to avoid or at least minimize animal exposure to them can be taken. If control measures are needed, contact your county agricultural extension educator for assistance. What are the Plants that Cause Animal Poisoning? We have no “official list” of poisonous plants in Wisconsin and there is no need to develop one. We can learn from what is already known and that tells us we do have plants of concern with regards to animal health. The book “Poisonous Plans of the Midwest” (Evers and Link 1972) includes 70 species. A Michigan bulletin (Marczewski 1985) cites 23 pasture plants that are toxic to livestock. A similar bulletin from Minnesota lists 13 species (Axton and Durgan 1991). Indiana lists 53 plants as potentially poisonous to animals on their “Indiana Plants Poisonous to Livestock and Pets” web site (address given at the end of this paper). They categorize these plants into three levels of toxicity. 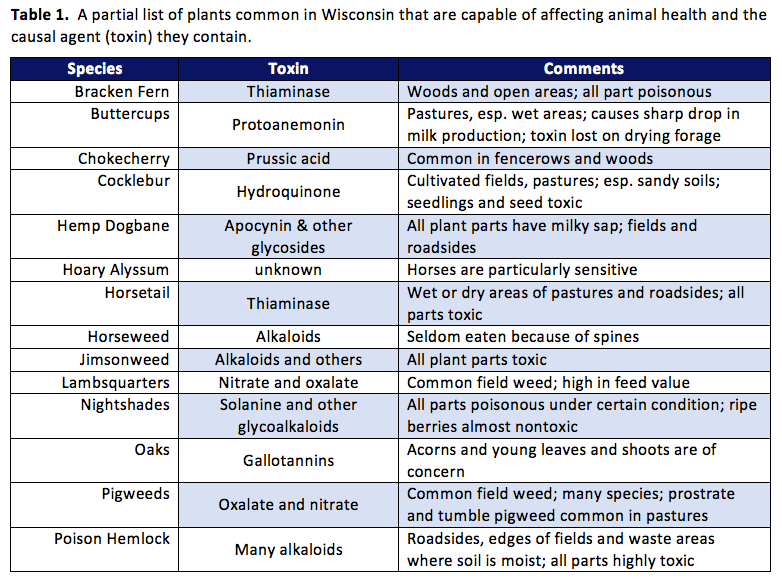 Based on these reports and our knowledge of the weeds in Wisconsin, we could say we there are 15 to 50 plants that could be considered as harmful to livestock in Wisconsin. The following table lists the 14 species we know are present in Wisconsin and merit caution of found in areas accessible to or if being fed to animals. What Influences the Risk and Seriousness of Plant Poisoning? The term “poisonous plants” is a relative one and it is seldom possible to say that a specific weed is always injurious to livestock. This is best illustrated by the fact that many poisonous plant books include species you and I as well as livestock often consume. Examples include corn, potatoes, sunflower and soybean as food crops and forages such as sweet, red and alsike clover; Sudan grass and alfalfa. The seriousness of animal poisoning varies with the quantity of the toxic plant consumed, size and species of the animal, general health of the animal, and concentration of the toxin in the plant, which in turn often varies with the stage of plant growth, weather conditions, soil conditions (especially the nutrient and moisture level), plant biotype, and other factors. Therefore, use the following table as a guide and not as the final word on whether these (or other) species are involved in cases of suspected livestock poisoning by plants. Minnesota considers the following to be the primary causes of cattle poisoning by plants (Axton and Durgan, 1991; listed in order of importance). Several years ago, Minnesota verified that horses that ingested relatively large quantities of hoary alyssum became sick and circumstantial evidence implicated this weed in the death of a few horses (Goer et al. 1992). This was a surprise as the toxicity of hoary alyssum to any species of animal had not previously been reported. Therefore, our current understanding of hoary alyssum toxicity is based on field reports and a few feeding studies. No cases of hoary alyssum toxicity in ruminant animals (dairy, beef, sheep or goats) have been reported to date. Some horses, however, have shown a response to this weed. In very rare cases, where hoary alyssum has composed extremely high percentages of the hay (30 to 70%), circumstantial evidence associates the plant with the death of a few horses. To date, death has not occurred in horses fed hay containing hoary alyssum under experimental conditions. In field cases where many horses consumed hay with 30 to 70% hoary alyssum, only approximately 50% of the animals demonstrated any clinical signs of toxicity. These clinical signs normally subside 2 to 4 days following removal of the alyssum source. In more severe cases, an apparent founder with a stiffness of joints and reluctance of the animal to move was noted. Recovery of animals with clinical evidence of founder may take several more days. The cases of severe “stocking up,” founder, and death have only been observed in horses ingesting hay with 30 to 70% hoary alyssum. Only mild “stocking up” has been observed in horses on pasture or those who ingest hay with low levels of alyssum (Becker et al. 1990). Most animals do not eat hoary alyssum if other feed is available. Grazing lambs rejected hoary alyssum in three different free-choice grazing trials. Cattle, sheep, and horses are commonly observed grazing in pastures where mature hoary alyssum remains untouched, while other available forage species have been overgrazed. In some field cases where free choice hay has been available, some horses have rejected hoary alyssum in preference to other forage in the hay thereby avoiding any possible toxic effects. However, animals without alternative choices will eat hoary alyssum and may develop clinical symptoms (Becker et al. 1990). Considering the widespread distribution of alyssum in region and the general lack of reported toxicity to animals, it is of relatively low toxicity to livestock compared to plants like jimsonweed, cocklebur or chokecherry. Complete avoidance of hoary alyssum in hay or forage is not an economical, practical or environmentally sound goal. Producers of ruminant animals should be aware of potential concerns when feeding hay with hoary alyssum. Livestock managers should be aware of the clinical signs and monitor ruminants for any indications of toxicity and remove alyssum-infested hay if problems develop. For horses, hay producers and horse owners should both be aware of toxicity symptoms and management needs regarding hay that may contain low levels of hoary alyssum. Owners should be alert for clinical signs of toxicity development and immediately remove alyssum-infested hay if symptoms develop. Hay with more that 30% hoary alyssum should not be fed to horses having appreciable economic or sentimental value. What to do if Poisoning is Suspected? As with many health-related issue, knowing the cause of the problem is the first step in determining the proper course of action. Plants may contain many known toxins and these can be grouped into categories of the symptoms induced by poisonous plants. I have listed only a few of the potentially poisonous plants in this paper. Many additional species can be poisonous to livestock. You may wish to have on hand one or more reference books that deal with poisonous plants. The following publications give significant details on the species listed above plus many others, describe the poisoning agent and symptoms or clinic signs observed, may give a suggested treatment, and are reasonably priced. A Guide to Plant Poisoning of Animals in North America. 2001. A. P. Knight and R. G. Walter. This new and excellent 367-page resource is unique in organization and comprehensive in scope. Its ten chapters are organized by the impact the poisonous plants have. For example, Chap. 1 is “Plants causing sudden death”, Chap. 2 is “Plant affecting the cardiovascular system” the Chap. 10 is “Plants affecting the mammary gland.” The authors give specific descriptions of the toxins involved and their modes of action and they have included a useful glossary of botanical terms. Geographic location maps are provided which highlight the distribution of specific plant species within North America. Some species are not found in the north central region as most poisonous plants that affect livestock are found in the rangeland in the plains and western regions. The book cites more than 470 species, 225 excellent full color pictures, and is rich is cited literature at the end of each chapter. For example, Chap. 5 lists plants that affect the skin and liver and has 197 references. This depth of literature and breadth of species presented reflect the more than 50 years of combined experience the authors have in this field. The book is available for $60 plus shipping from Amazon. Order online at https://www.amazon.com/Guide-Plant-Poisoning-Animals-America/dp/1893441113. Poisonous Plants of the Central US. 1980. H. A. Stephens. It contains 165 pages and includes black and white photos of several aspects (leaves, seeds, whole plants, etc.,) of many poisonous species. The book can be ordered for $15.95 (plus $3.00 for shipping) from 2501 West 15th St., Lawrence, KS 66049. An order form is available at http://www.kansaspress.ku.edu/order.html or you can call 785-864-4155. Pasture Plants Toxic to Livestock in Michigan. 1985. Alice Marczewski. This 8-page publication is general in nature and gives a description of the plant, the dangerous times of the year, the habitat and distribution, the animals affected and the toxic principles and effects for 23 weeds. These species could also be found in Wisconsin. It also has a table listing crop plants that can possibly be poisonous. Extension bulletin E-1725 available from MSU Bulletin Office, 10-B Agriculture Hall, East Lansing, MI 48824-1039. Michigan State University, East Lansing, MI 48824-1039. You may also FAX your order to 517-353-7168. The Canadian Poisonous Plants Information System (http://www.cbif.gc.ca/eng/species-bank/canadian-poisonous-plants-information-system/?id=1370403265036) is rich in information and is thorough in how it can be searched. For example, I indicated I wanted information on bloat in cattle and given a list of 12 plants (alfalfa, black henbane, Iceland poppy, jimsonweed, low larkspur, Menzies larkspur, red clover, redroot pigweed, western water-hemlock and white clover) that matched the symptom with type of animal. A total of twelve search categories are offered and many bring up submenus as well and all include a list of published references for the plant of concern. The site is linked to wonderful connections to give numerous colored views of each plant in the database. The Cornell University Poisonous Plants Informational Database (http://www.ansci.cornell.edu/plants/index.html) has these sections and links to other sites on poisonous plants. ∅ Search Poisonous Plants database by name, species affected, primary poison, etc. ∅ Medicinal Plants for Livestock – Beneficial or Toxic? The USDA Poisonous Plant Research Lab is based in Logan, Utah and deals with toxic plants in the western states (https://www.ars.usda.gov/pacific-west-area/logan-ut/poisonous-plant-research/). Several of the species and poisonings described occur in the Midwest as well. Axton, L.M. and B.R. Durgan. 1991. Plants poisonous to livestock. Minn. Exten. Ser. Bull. AG-FO-5655-D. 14 p.
Becker, R., N. Martin and M. Murphy. 1990. Hoary alyssum: Toxicity to horses, forage quality and control. Univ. Minn. Exten. Ser. Dept. Agron. Plant Genetics. Crop News No. 91. 4 p.
Ellison, S.P. 1992. Possible toxicity caused by hoary alyssum (Berteroa incana). Vet Med/Equine Practice. May issue, pp. 472-475. Evers, R.A. and R. P. Link 1972. Poisonous Plans of the Midwest. Univ. Ill. College Agric., Urbana-Champaign. Spec. Public. 24. 165 p.
Goer, R.J., R.L Becker and E.W. Kanara. 1992. Toxicosis in horses after ingestion of hoary alyssum. J. Amer. Vet. Med. Assoc. 201: 63-67. Marczewski, A. 1985. Pasture plants toxic to livestock in Michigan. Mich. State Univ. Coop. Exten. Ser. Bull. E-1725. 8 p.
Williams, M.C. 1994. Impact of poisonous weeds on livestock and humans in North America. Rev. Weed Sci. 6;1-27. Does Forage Quality Pay? by Dan Undersander, UW Extension Forage Agronomist University of Wisconsin, Madison, WI 53706 email: djunders@wisc.edu Does forage quality pay? Absolutely, it pays in many ways for different situations. It may help produce the maximum return through high milk or meat production; it may increase breeding success; it may help a producer allocate different pastures or forage lots to the appropriate animal group, or it may help get higher prices for hay that is sold.